Once liquidated, does the Downtown Development Corp. of Arizona have an obligation to return the assets initially provided by the city? This question and more will be considered by tonight’s Tucson Mayor and Council meeting. Please come and support the low income elderly and disable who are removed in favor of Rio Nuevo Developers. NEW ORLEANS — A federal judge ruled Wednesday that the Army Corps of Engineers’ failure to properly maintain a navigation channel led to massive flooding in Hurricane Katrina. U.S. District Judge Stanwood Duval sided with five residents and one business who argued the Army Corps’ shoddy oversight of the Mississippi River-Gulf Outlet led to the flooding of New Orleans’ Lower Ninth Ward and neighboring St. Bernard Parish. He said, however, the corps couldn’t be held liable for the flooding of eastern New Orleans, where one of the plaintiffs lived. Duval awarded the plaintiffs $720,000, or about $170,000 each, but the decision could eventually make the government vulnerable to a much larger payout. The ruling should give more than 100,000 other individuals, businesses and government entities a better shot at claiming billions of dollars in damages. Joe Bruno, one of the lead plaintiffs lawyer, said the ruling underscored the Army Corps’ long history of failure to properly protect the New Orleans region. “It’s high time we look at the way these guys do business and do a full re-evaluation of the way it does business,” Bruno said. The corps referred calls seeking comment to the Justice Department. The corps had argued that it is immune from liability because the channel is part of New Orleans’ flood control system, but the judge allowed the case to go forward. 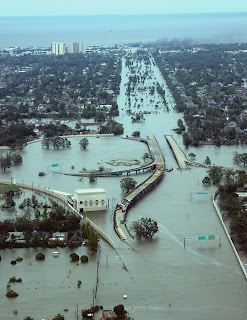 Many in New Orleans have argued that Katrina, which struck the region Aug. 29, 2005, was a manmade disaster caused by the Army Corps’ failure to maintain the levee system protecting the city. The Mississippi River-Gulf Outlet is a shipping channel dug in the 1960s as a short-cut between the Gulf of Mexico and New Orleans. Architect Jody Gibbs Invites Fellow Architects to Showing of "Loose Change 9/11: An American Coup"
1) Video analysis of the World Trade Center collapses and forensic examination of the debris show that the buildings’ concrete and glass and all contents were reduced to dust of less than 100 microns in mid air. Neither the air planes’ crashes nor the collapses of the buildings can explain this. FEMA admits that most of the aviation fuel exploded on impact. The amount of energy needed is enormous. 2) No high rise steel building has ever failed due to fire in the entire history of construction and numerous buildings have been hit by planes or have burned for days without their structures collapsing. Aviation fuel burns at approximately 1700 degrees, steel gives way at approximately 3000 degrees. 3) Forensic evidence of the debris at the World Trade Center shows the clear presence of thermite and thermate explosives. 4) All three of the World Trade Center buildings which collapsed (Buildings 1, 2, and 7) fell neatly into their own footprints with all of the characteristics of a controlled demolition destruction. 5) The World Trade Center Towers were designed to withstand the impacts and damage caused by multiple 747’s hitting each building. It was a design criteria. The structures were extremely redundant with continuous perimeter columns and an enormous steel braced central cores. Box beams at the lower levels of the center cores in buildings 1 and 2 were 2 feet by 3 feet in section made of 4 inch thick steel. 6) All three buildings at the World Trade Center (Buildings 1, 2 and 7) collapsed at free fall speed. This is only possible if the vertical structure had been removed. Fifty ton columns were hurled laterally for hundreds of yards. 7) There is eye witness testimony from firemen, policemen, building survivors,and news reporters of hearing and experiencing numerous and repeated explosions within the buildings both prior to and after the aircrafts’ impacts and before the buildings’ collapses. 8) At the Pentagon it has not been explained how an aircraft with a 140 foot wingspan, a 40 foot high tail, and 2 five ton titanium engines could disappear into a 20 foot diameter hole without leaving any other damage to the exterior of the building. Titanium melts at a much higher temperature than steel and far beyond the temperature of burning aviation fuel, yet no engines were found at the Pentagon. After several years of court procedures air force members of “Pilots for 9/11 Truth” were given what was said to be the flight data recorder. Examination of this device indicated that the plane would have been 800 feet too high as well as off course to have hit the Pentagon. 9) The Pentagon is the most secure military location in the world. The Pentagon is surrounded by hundreds of security cameras, and by missiles that deploy automatically if an aircraft enters the Pentagon’s restricted air space without the correct transponder in the aircraft. Yet the government even under court order could produce no photo of a plane hitting the Pentagon and no missiles ever fired. 10) World Trade Center Building 7 was a 47 story building that collapsed in seven seconds into its footprint at 5:20 P.M. on September 11. It was never struck by a plane nor had it sustained serious damage. Its collapse was not shown on most American T.V. stations on September nor was it reported in the press the following day. No explanation has ever been given for its collapse. It is not mentioned in the 9/11 commission report. Its collapse however was announced on the BBC in England on September 11 at 5:00 P.M. or twenty minutes before it collapsed. In August of 2009 NIST the federal agency tasked with the investigation of 9/11 suggested that it may have collapsed due to “burning office paper”. Unfortunately the 9/11 Commission was not a court procedure or a scientific investigation. Instead it was a public hearing convened by politicians. There was no forensic investigation for explosives. World Trade Center Building 7 was not even investigated. No explanation was given for the pulverization of the concrete in mid air, nor the free fall time of the collapses, nor the lack of exterior damage to the Pentagon, nor the lack of discovery of the Titanium engines. It was the type of “investigation” where family members of victims were paid one million dollars and asked to sign statements that they would not speak to the press nor sue the government. Eyewitnesses (firemen, policemen, survivors, news personnel, and others) in the buildings or at the site were never called to give testimony. The Commission itself was not even assembled until over 400 days after September 11. Both of its chairmen have now stated they did not receive cooperation from numerous military and government agencies. There were members of the FBI, the NSA, military intelligence, and numerous scientific and engineers experts who wished to present information to the Commission contradicting the official story, but were denied the opportunity. Considerable time has been devoted by corporate media television to demonize “conspiracy theorists”. Typical examples of this would be the Popular Mechanics article and the history channel. Their efforts are focused on discrediting dissent as “conspiracy theorists” rather than examining the serious issues raised above. The corporate media has played a major role in the “rush to judgment”. The FBI claimed it had identified the highjackers within days of September 11. U.S. forces attacked Afghanistan within six weeks of September 11. Then they attacked Iraq theoretically because they had weapons of mass destruction, but none were ever found. Eight thousand American soldiers and contract workers have been killed. Over 40,000 U.S soldiers have been seriously wounded. Hundreds of thousands of Iraqis and Afghanis are dead, mostly civilians. Three trillion dollars have been spent on these wars to date. Torture and rendition have followed. And soon apparently we will have trials in the United States based upon evidence obtained under torture, something the world has not seen on this scale still since Stalin’s show trials of the 1930’s. As architects I ask you to begin to look at the evidence available on 9/11. At the moment one cannot say who exactly was responsible for 9/11, but I do think reasonable people who look at the evidence will conclude that we need an objective scientific investigation of the events of 9/11 with legal procedures regarding evidence. On Monday evening, November 23, the documentary “Loose Change 9/11 An American Coup” will be shown at 7 P.M. at the Crossroads Cinema at 4811 East Grant Road. That is behind the shopping center at the northeast corner of Grant and Swan. I recommend it. If you are shy about coming to a movie I urge you to visit Borders or Barnes & Noble or Amazon and look at any of the books by Professor David Ray Griffin, an emeritus professor of comparative religion at Claremont College whose books on 9/11 are extremely well researched and documented. Or on your computer, go to “Architects and Engineers for 9/11 Truth” and look at documentaries such as “Loose Change”, “Loose Change 2nd Edition”, “9/11 Mysteries”, or “9/11 Revisited”. The issue is not determining all the answers, but rather clarifying that there is sufficient reason for conducting an investigation of the events of 9/11 based upon science and legal procedures of evidence. Downtown Development Corp. of Arizona, in violation of their their contract (Number 0493-90), will remove the low income residents of the Coronado Hotel and place the property on sale to developers for $680,000.00. As a follow up to progress made by the local court hearings concerning fair elections, Bill Risner wrote out an eye-opening 14 page proposal concerning election integrity in the state of Arizona. As many of you know by now, the Pima County Democratic Party, flush with party worshipers in their last two meetings, elected to abandon the most important judicial pursuit in the election integrity legal battle. 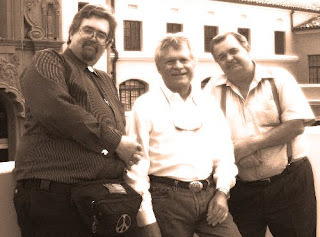 This pursuit (helmed by Bill Risner, pictured in the center between Jim March and John Brakey) was to determine once and for all whether the courts can act as the ‘checks and balances’ to provide prospective relief for election fraud when the other two branches of government fail. The reasons for dropping the appeal? First was cost, but that was removed from the table almost immediately as activists turned their pockets inside out. Email correspondence with those justifying their decision to back out kept alluding to the importance that “Terry Goddard become governor”. Another failed rationale was “better our crook than their crook”(in the words of an anonymous participant). There were also the discontented rumblings of other lawyers in the Democratic party that the case was unwinnable. Here again, the importance of determining one way or another exactly what the courts’ powers are when it comes to election integrity is lost. The lack of interest in pursuing this matter to its conclusion is perhaps more damning than the arguments about costs or Terry Goddard. Still, the elephant in the room is the “protect Terry Goddard” argument. Terry Goddard should not be relevant to what is discovered with a proper audit/examination of the ballots and poll tapes. If Goddard had done his job properly in the first place, there wouldn’t be a need to abandon any part of this case out of concern for tarnishing Goddard. The party’s protectiveness is an admission that Goddard’s hands are somewhat less than clean. It seems that there was plenty of time to come up with a suitable Democratic candidate for governor back in late spring of 2007. It was at this time that Goddard allowed the suspects in this case to shape the investigation, which later became the IBeta report. These shenanigans were already sufficient to disqualify Goddard as a viable candidate for governor. Put another way, a lack of planning on the part of the Democratic Party should not mean that everyone suffers with this lack of resolution. Fortunately, the Libertarian Party joined the case and will continue this pursuit while all concerned with this issue will help offset their legal costs. Here is the eye-opening proposal in pdf format by Attorney Bill Risner to the Democratic Party for pursuing election integrity. Many will be very interested in the response. Late Saturday night, Congress passes H.R. 3962. The next day, Single Payer Now celebrates with a band jam fundraiser for those strapped with medical bills. Spare change. In 2006, “Hacking Democracy” demonstrated how an election outcome can be altered. What happens in a community when its citizens discover their election was stolen? Fatally Flawed is a true detective story about a two billion dollar bond transportation measure passed under suspicious circumstances in Pima County, Arizona. This is shocking courtroom footage of a Maricopa County detention officer snooping through a defense attorney’s file at a sentencing hearing. Maricopa County Sheriff’s Department detention officer Adam Stoddard takes a piece of paper from the middle of the attorney’s file and hands it off to another officer while the defense attorney, Joanne Cuccia, has her back to them. The only witnesses (aside from the stunned defendant) were the judge and the prosecutors. As well as being an in-your-face violation of attorney-client privilege, Officer Stoddard has committed crimes plural, starting with theft. It’s not too surprising to see the Maricopa County Sheriff’s Department officers act like the law does not apply to them. After all, this is the law enforcement body, under the guidance of Sheriff Joe Arpaio and AG Terry Goddard, that transported the ballots out of Pima County and “secured” them for several weeks at an undisclosed location. Still think the RTA election was clean?